The coast range in Oregon can receive up to 200 inches of rainfall annually, and the Willamette Valley may get from 50-100 inches or more annually. If you look on a map of the Oregon coast you will see, from the Columbia river to the California border, there are lots of rivers. These coastal streams flow off the range between the Pacific and the Willamette Valley, they are short and the country they flow through is wild. Some places, in spite of being so close to Portland, Corvallis and Eugene, are true wilderness areas, where you can get away from the hustle and bustle and forget about the city. 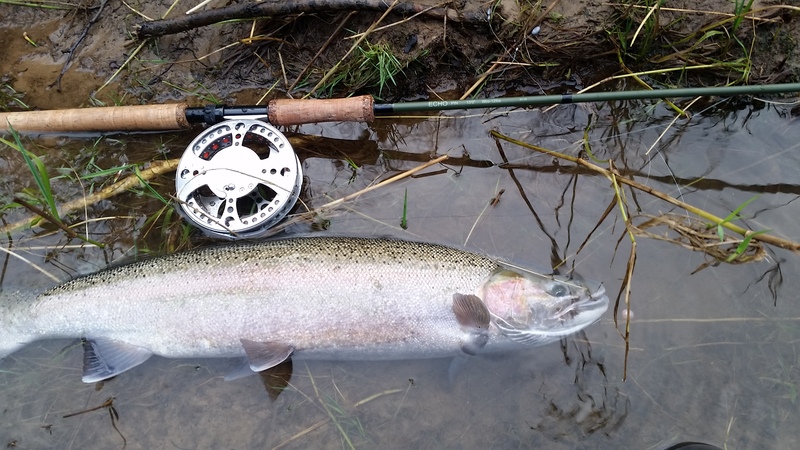 It’s from December till March that we can focus on these streams for winter steelhead. The Siuslaw, and Alsea are just a couple in the area where I fish, however, weather, river levels, and runs will determine where we choose to go. Many of these streams have a hatchery run, however fishing some of the lesser known streams which are not stocked can be a real treat. There are a handful of streams that have wild runs of steelhead that can be a lot of fun for a day of fishing, and I would rather keep their names a mystery over the internet, as you can have miles of these streams all to yourself, and I would like to keep it that way. These coastal streams host runs of fall chinook salmon, we see a few days of salmon fishing that are as good as Alaska and better.